"1/4" ("quarter wave rod"): It is in general a wire of a length calculated by formula l=(300 000/f)/4 (where f is the frequency in MHz, the result is in mm). It is a standard with 0 dB gain. Theoretically, this lambda/4 antenna should be installed above ideal ground plain. However, this wire works with slightly reduced effectiveness also if the ground if fare from theoretical. In praxis it is mounted on care roofs (metal!) and used for reception of vertical polarization. How to do it: Use a piece of wire mounted on isolated leadthru or magnetic basement where it is directly connected to the center conductor of the coaxial cable which shield is mostly unattached. The length for 144MHz is 520 mm, for 173 MHz 430mm and for 401 MHz 180mm. "5/8": It is omni directional whip antenna with gain about 3 dB. A whip of about 5/8 lambda lengths is connected to the cable via a small coil. This construction again needs for its proper function an "infinite conducting ground plain" that is mostly substituted by a care roof or counterbalance radial elements. How to do it: Difficult to design without measuring. Use a commercial CB antenna that is designed for 144 MHz. For higher frequencies (up to 174 MHz) adequately shorter the rod. The signals of VHF transmitters reveal mostly a horizontal polarization so the reception by this antennas is limited. Ground plains can be substituted by balance elements. This design is fragile and in fact the construction is approaching to a more compact dipole that can be used also in a vertical polarization instead of it if installed on a proper mast. Folded dipole is the simples but with many disadvantages (transformation, less selective). Sleeve dipole is a very effective antenna. 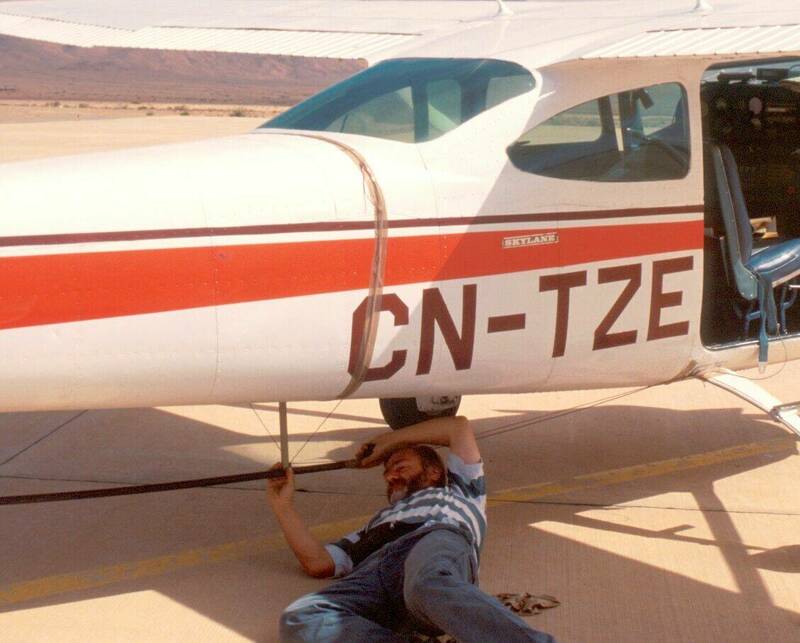 We use it in aerial monitoring (see below). Dipole with taper is well selective. Effective reduction of strong spurious signals is useful especially in combination with scanners that are less resistant to cross products. Basic radiotracking antenna with a compact design and good radiation diagram. Simple packaway construction. Taper adjusted to used frequency with a high resistance to strong spurious signals. Dimensions for 173MHz: elements - 790, 810, 860, spacing 235, 255 and taper about 110 mm. Simple sleeve dipole 20 cm below fuselage that act like a reflector is fed by a thin coaxial cable thru the door. Easy installable on small planes like Cessna. Dipole enables a general location due to its maximum gain to the sides. As quick replacement use a thin coaxial cable whose unshielded end lamda/4 long is hanging outside the plane. During the flight it flies in the wind in a horizontal position and thus it has the maximum reception to the sides. Two fixed car mounted antennas (Yagi or HB9CV) directed to the sides provide effective scanning of the area during the ride in a car. When searching for signals, both are together (in a simple "electrically incorrect" parallel connection) connected to a receiver. Three way switch (left/both/right) together with a car positioning enable the signal location. Two fixed car mounted antennas (3 element yagi) directed to the sides. 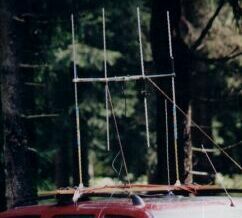 Two fixed car mounted antennas (HB9CV) directed to the sides (light version). Two fixed antennas (HB9CV) directed to the sides in a vertical position are effective in montaneous regions. 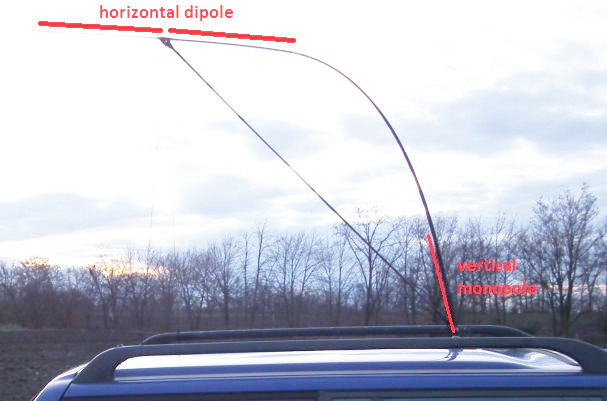 Simple dipole fixed on a bent laminate fishing-rod above a car roof is also effective to sides (very light attached using magnet base).